Water, pumpkin (14%), potatoes (8.8%), coconut cream (8.8%), modified corn starch, sugar, SOY sauce (sugar, water, SOY Sauce (contains SOYBEAN), salt, rice vinegar, corn starch), sambal (red chilli pepper, water, salt, spirit vinegar, modified starch), flavourings, spices (turmeric, ginger, coriander), salt, herbs (lemongrass, Kaffir lime leaves), red chilli pepper, garlic paste, lime Juice concentrate. 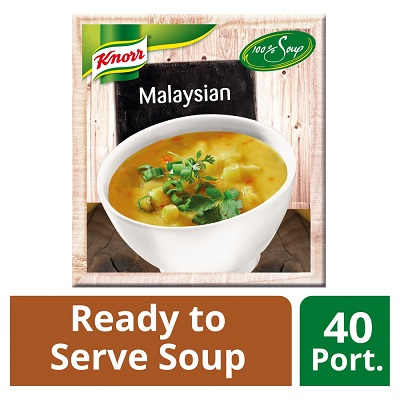 A ready prepared medium spiced Malaysian style curry soup with coconut, potato, pumpkin and lemongrass. Store in a cool dry place. Once opened refrigerate any unused product and keep for max. 48 hours at max. 7°C. If pouches remain unopened after heating, they can be cooled down to < 10°C (following HACCP rules) and reheated to above > 75°C for use within 24 hours.